Coconut water is a natural, fat-free drink. Low in sugars and calories, it is rich in essential electrolytes and vitamins. Dubbed the “fluid of life”, coconut is safe for everyone to drink fresh from the nut. As the Hawaiians say, coconut water is “dew from the heavens”. Once the coconut is opened, coconut water begins to lose its nutrients and flavours. This is partly due to naturally occurring enzymes found in coconut water. When peroxidase (POD) and polyphenol oxidase (PPO) come into contact with oxygen, reactions cause nutritional and flavour losses. This section covers the reactions that happen when coconut water is extracted and loses protection of the coconut’s sterile environment. Analytical studies have shown that coconut water contains nutrients such as glucose, amino acids and electrolytes such as potassium, calcium and magnesium (Table 7.1). While the composition of coconut water was covered in Chapter 3, it is important to recall the differences in the composition of coconut water obtained from young (7-9 months) and mature (10-13 months) coconuts. The composition, physicochemical, PPO and POD enzyme activities are influenced by factors such as geographical location and variety. The compositional differences relate to the effects deterioration reactions have as well as the quality aspects of coconut water. In general, young coconuts have higher sugar levels and total phenolic contents than mature coconuts. While mature coconuts have higher protein levels and pH values than young coconuts, the amount of minerals can also vary between young and mature coconuts. For example, the amount of potassium in coconut water increases as the coconut matures. Flavour is the complex experience of smell, taste and mouthfeel. 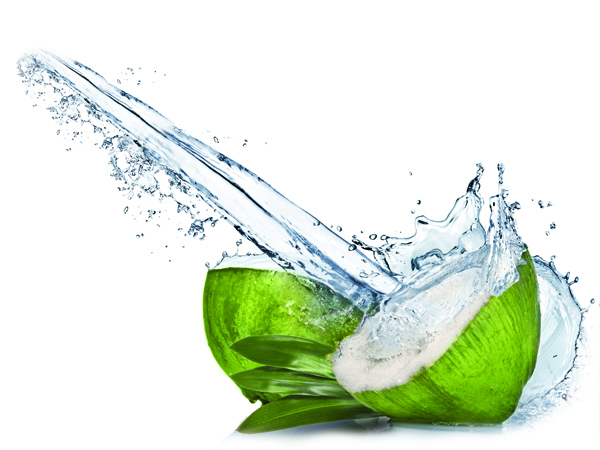 The flavour profile of coconut water is built from acids, sugar, phenolic compounds and mineral content. Coconut water extraction, formulation, processing and storage can also affect the flavour. Between 7-9 months, the sweetness of coconut water increases to its maximum when sugar content increases. From 10-13 months, the sugar levels decrease and coconut water tastes less sweet. This is represented by total soluble solids (°Brix). Left at a room temperature of 25°C, fresh coconut water turns sour, as various oxidative and fermentative reactions occur. This forms acids as products. To maintain the acceptability of fresh coconut water, it should be kept under chilled condition at all times. In general, acidity of coconut water decreases with maturity, and this contributes to the increasing sweetness of coconut water between seven to nine months. The phenolic content also contributes to the overall flavour profile of coconut water. It decreases with maturity, hence mature and young coconut water tastes significantly different. When oxidized, the polyphenols can also lead to a complex reaction, resulting in the undesired discolouration of coconut water. Rancidity refers to developing off-flavours when the hydrolysis, oxidation or microbial degradation of lipids form free fatty acids (FFA), which subsequently undergoes further reactions and yield off- flavoured ketones. While coconut water does not contain much oil content, the lipids present may cause rancidity. Depending on the number of carbons, these ketonic compounds give different off-flavours. For example, heptan-2-one gives a rancid almond flavour while nonan-2-one gives a turpentine flavour (Kellard et al., 1985). For more details, please refer to Chapter 8 on lipid oxidation and lipolysis. Coconut water is a relatively clear, colourless liquid. Its appearance is affected by coconut maturity and environmental exposure. Turbidity refers to the extent which coconut water appears to be unclear. Naturally, it increases as coconuts mature. In addition, turbidity is influenced by the total dissolved sugars, proteins, and other matters. It is also affected by the count of microorganisms when coconut water is exposed to the environment upon extraction. When this happens, microorganisms multiply and contribute to the increasing turbidity of coconut water. Hence, if a young coconut water is left exposed with no control measures like cooling, it can turn as turbid as mature coconut water in a matter of hours. Due to high oxidation and heat, coconut water can turn from clear or slight white turbidity to brown. This is brought by complex reactions in its components. Typically, it is caused by phenolic oxidation, Maillard reaction and caramelization. These browning reactions are also found in other beverages like green tea, apple and sugar cane juices. The quality of coconut water is preserved when these reactions can be retarded or stopped completely. Enzymatic browning is one of the most important colour reactions that affect fruits, vegetables, and seafood. When coconut water is extracted, its exposure to air initiates reactions like oxidation. This is promoted by enzymes polyphenol oxidase (PPO) and peroxidase (POD) which are naturally present in coconut water. When enzymes catalyse, the oxidation of phenolic compounds present in coconut water form brown pigments. In Table 7.2, the assessment shows that the enzyme activity of PPO is higher than POD. PPO is also more heat resistant than POD. 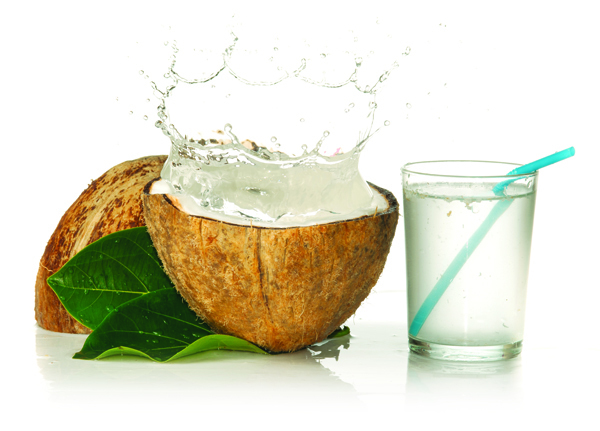 In the case of coconut water, PPO is used as the indicator for enzyme deactivation treatments. 1 A unit of enzyme activity refers to the amount of enzymatic extract necessary to produce an increase of absorbance at rates of 0.001 unit per millilitre of sample per soluble solids content per minute (U mL-1 °Brix-1 min-1 ). Without PPO and POD enzymes, phenolic browning can still occur when oxygen is present. This takes place at a reduced rate in coconut water. Maillard reaction causes proteins to deteriorate when food is processed and stored. This reaction can promote the loss of nutritional quality when essential amino acids are destroyed. It also reduces protein digestibility and amino acid availability. Maillard reaction covers a whole range of complex transformations. Starting with a reaction between a reducing sugar like glucose and an amino acid, it ends with the formation of melanoidins which are brown, high molecular weight heterogeneous polymers. Due to its low sugar content, a very small extent of caramelization takes place when coconut water undergoes heat treatment. Pinking is a phenomenon that happens only in young coconut water. Pinking is due to the intermediate compounds formed from the enzymatic phenolic oxidation of coconut water. Compared to mature coconut water, young coconut water consists of a higher phenolic content, PPO and POD enzyme activity (refer to Table 7.2 for the differences between these enzyme activities). In the primary process, PPO catalyses the oxidation of phenolic compounds to form brown polymers (Villamiel et al., 2006). The substance which causes pinking is an intermediate in this reaction, i.e. o-quinone (Mathew et al., 1971). In the secondary process, this pink or red compound can further react with amino acids to form more compounds like p-amino-o-quinone (Mathew et al., 1971). Coconut water contains many water-soluble vitamins (see Chapter 3, Table 3.4). In particular, Vitamin C is a sensitive compound in coconut water. It reacts with oxygen, and its loss is consequently closely related to the availability of oxygen in packages. In general, Vitamin C is lost through anaerobic and aerobic degradations. Both anaerobic and aerobic degradations take place simultaneously. Which one predominates the other depends on storage temperature and the availability of oxygen. As the name implies, the anaerobic pathway does not need oxygen. It is mainly driven by storage temperature. Losses caused by aerobic degradation pathway cannot be prevented by packaging, which is consistent for all types of package. The only possible countermeasure is to reduce the storage temperature. For aerobic degradation, the pathway needs oxygen. This is strictly related to the presence of headspace oxygen, the dissolved oxygen in coconut water, and the oxygen barrier properties of the package. Raw, natural, unprocessed coconut water affects the final quality of the packaged product. While there are ways to preserve and maintain the quality of the raw material, it is not possible to improve it. To increase shelf life, tender and mature coconuts should be harvested carefully. The perianth should remain intact, and the nuts should not be broken or cracked. 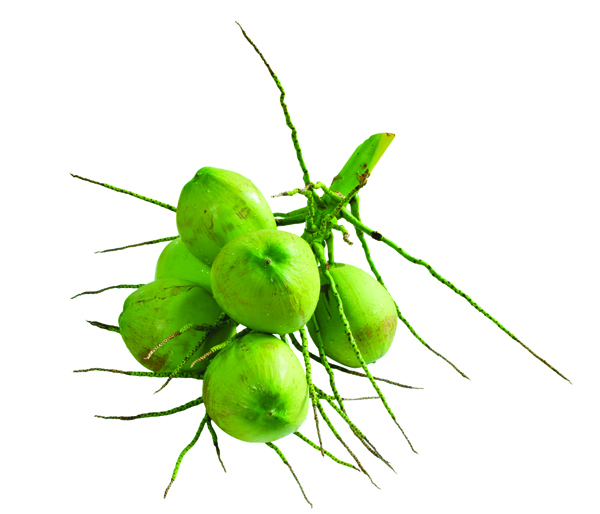 Compared to partially dehusked nuts, the quality of coconut water from non-dehusked nuts can be maintained for an extended period of time. After harvesting, the husk of the coconut helps to minimize the above changes in the coconut water over the storage period. The husk also acts as added protection from cracks that would lead to the contamination and eventually spoilage of coconut water. As the husk helps to preserve nut quality and increase the storage life of coconut water, the taste of stored dehusked nuts can subsequently become less desirable than non-dehusked nuts. Different extraction methods, like drilling or halving the nuts, vary the effect on coconut water extraction. This is because young and mature coconuts have different husks and shells. In drilling, there is generally less contamination by coconut fibres, soil and enzymes from the other parts of the coconut. However, the likelihood of contamination increases for mature coconuts. As the fibres are drier and shells are harder, it is easier for them to fall into extracted coconut water. This is why right after extraction, filtration is an important step to remove the contaminants. Heat has positive and negative effects on coconut water, depending on the range of temperature and the parameter under observation. In general, an increase in temperature results in an increase in reaction rates. At certain temperature ranges, this may lead to negative effects such as browning and microbial multiplication. Hence, coconut water should be cooled down to below 4°C after coconut water extraction and filtration. To balance between both heat effects on coconut water, factors across the whole chain like raw material quality, hygienic handling and even governmental regulations need to be taken into account when processing and packaging coconut water. On the other hand, proper application of heat treatment results in positive effects on coconut water. For example, heat can be used for enzyme deactivation, pasteurization or sterilization to kill off pathogens and spoilage microorganisms. Specifically, in direct heat treatment like steam injection, the temperature quickly rises and falls at the start and the end. Thus, there is less thermal impact than indirect heat treatment. As a result, coconut water that undergoes indirect heat treatment becomes browner at the start of their packaged shelf life. Based on its browning index, it also has a shorter shelf life. For more information on direct and indirect heat treatments, please refer to Chapter 11. Between young and mature coconut water, the latter spoils faster. As compared to the former, the quality parameters like pH and turbidity are sub-par. There is also likely to be more contamination in mature coconuts, as more husk and shell pieces fall into the extracted water during drilling. In addition, mature coconut water is typically more turbid than young coconut water at any stage of storage. As temperature increases from 4-35°C during storage, there is a faster change in the total soluble solids content, pH, and titratable acidity of untreated coconut water. There are also noticeable visual changes for mature coconut water. For example, turbidity increases, browning occurs and pH decreases. With oxygen exposure, aeration accelerates pinking and browning. This is due to oxidation of polyphenols which are catalysed or otherwise. Thus manufacturers often add antioxidants like ascorbic acid and sodium metabisulphite to scavenge oxygen, making it unavailable for other reactions. Alternatively, nitrogen blanketing may be used in storage and aseptic tanks, where sterile air is replaced with nitrogen. As a result, the air in the headspace contains 99.9% nitrogen, an increase from an initial content of 78% nitrogen and 21% oxygen. Ascorbic acid, otherwise known as Vitamin C, plays an important role in food processing. Vital for human nutrition as well, its key antioxidant effect acts as an inhibitor of enzymatic browning. This has been widely used in the food industry. However, with high ascorbic acid levels and the presence of oxygen, browning may also occur. This is due to the thermal decomposition of ascorbic acid. By its very nature, coconut water does not contain much ascorbic acid. However, when ascorbic acid is added as an antioxidant, close attention must be paid so its level does not get so high that it promotes ascorbic acid browning instead. In general, ascorbic acid levels of 20-50 ppm can help to minimize enzymatic browning. Antioxidants are often added to control discolouration. It also helps to extend coconut water’s shelf life. They work by scavenging oxygen or free radicals. Commonly used, the two effective antioxidants for coconut water are ascorbic acid and sodium metabisulphite. When oxygen reacts with SMB, it becomes unavailable for other browning reactions. Sulphite also reduces o-quinone, which is produced by PPO catalysis, to a less reactive diphenol. This prevents later condensation of complex brown melanins. While most countries regulate the presence of SMB in coconut water at 30 ppm maximum, it is advisable to check with local authorities on the most recent permissible levels of this antioxidant. Microorganisms are frequently used in producing food products like cheese and yoghurt. However, certain microorganisms can cause food poisoning, human disease, and spoilage. In microorganisms, there are many biochemical and enzymatic systems concerned with coconut water and its products. These can be subdivided into which constituents they break down into and their respective effects. A specific microorganism’s activity is governed by the enzymes it possesses, as these determine what it can feed on, break down, and also what end-products it produces. Fat is broken down by enzymes (mainly lipase) in a process called lipolysis into free fatty acids. Through normal processing routines like pumping, stirring and splashing, there is a higher chance for lipase to work on the oils. While some of the fatty acids produced are volatile, give off strong smells, or contribute to a sour taste, many bacteria and moulds that break down proteins also break down oil through oxidation. Lipolysis is covered in more detail in Chapter 8. During the extraction of coconut water from mature coconuts, oil from the kernel can enter the coconut water. These minute amounts of oil, if broken down, can result in a rancid taste profile. The microorganism’s enzymes determine which carbohydrates they can break down into, and to what extent. While fermentation occurs in most cases, carbohydrates can be completely degraded to carbon dioxide and water through oxidative metabolism. Usually, fermentation produces organic acids (e.g. lactic and butyric acids), alcohols (e.g. ethyl and butyl) and gases (e.g. carbon dioxide and hydrogen). In general, carbohydrate fermentation results in the production of acid (souring, pH drop) and gases, depending on the organisms (Table 7.3). When carbohydrates breakdown in coconut water, it turns sour and have an unacceptable odour. Proteins break down in a process called proteolysis, which involves the enzymes called proteases. When they degrade proteins into peptides, they are further degraded by various peptidases to smaller peptides and amino free acids. While amino acids can be reused again for protein synthesis to grow or multiply microorganisms, they can also be broken down by oxidation or fermentation processes. Proteins and their constituent amino acids have a wide combination of chemical elements. They contain carbon, hydrogen, oxygen, sulphur, nitrogen and phosphorus. Therefore, the breakdown of protein results in a much larger range of acids, alcohols, gases like hydrogen, carbon dioxide, hydrogen sulphide, ammonia, and other compounds. In particular, ammonia, which is alkaline and has a strong odour, is always produced. For more information on proteolysis, please refer to Chapter 8. As coconut water contains trace amounts of sulphur-containing amino acids (e.g. methionine and cysteine), the breakdown of these amino acids may produce hydrogen sulphide, which gives off a rotten egg smell.